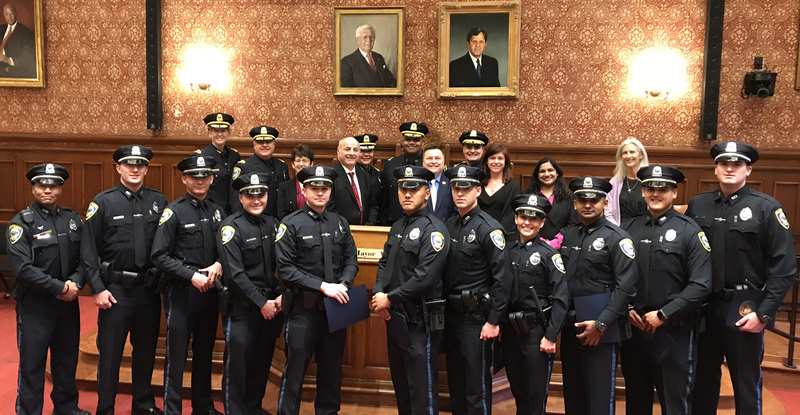 The Cambridge Police today announced that 10 new police officers joined the department after successfully completing their 24-week training and graduating from the Lowell Police Academy. After graduating from the Lowell Police Academy on Friday, Officers Nicholas Ayoub, Donald Conrad, Eddie Foster, Brien Joensuu, Muhammad Khalid, Tenzin Kunchok, Devin McMahon, Matthew Reagan, Alyssa Roderick and Christopher Wellborn were sworn in by City Clerk Donna Lopez in front of their family and friends. A Welcoming Ceremony was held this morning in City Hall for the new officers. Among those in attendance were City Manager Louis DePasquale, Deputy City Manager Lisa Peterson, members of City Council, Cambridge Fire Department Acting Fire Chief Gerry Mahoney, and former and current members of the Cambridge Police Department. Nicholas Ayoub is a Matignon graduate and a former Cambridge Parks Department employee. Donald Conrad is a Cambridge Rindge & Latin graduate. He has served in the U.S. Marines and formerly worked for the Mayor’s Summer Youth Employment Program. Eddie Foster is a Cambridge Rindge & Latin graduate and former employee of the Mayor’s Summer Youth Employment Program. Brien Joensuu is a Matignon graduate and has been a Cambridge Auxiliary Officer since 2015. Muhammad Khalid is a Cambridge Rindge & Latin graduate and has been a Cambridge Auxiliary Officer since 2015. He is fluent in Urdu, Hindi, and Punjabi. Tenzin Kunchok serves in the Army National Guard and speaks Tibetan and Hindi. Devin McMahon was a squad leader at the Lowell Police Academy. He is a Cambridge Rindge & Latin graduate, brother of a Cambridge Police Officer, and former employee of the Cambridge Public Works and Water Departments. Alyssa Roderick has been a Public Safety Officer at Cambridge Hospital for the last 11 years and was a platoon leader at the Lowell Police Academy. Christopher Wellborn graduated with a Criminal Justice degree from UMass Boston and has been a Public Safety Officer at Cambridge Hospital since 2014. For pictures and archived video from this year’s ceremony, please visit www.facebook.com/CambridgePolice.